13~15 April, 2019, Shomyo workshop at Zen Temple of La Gendronnière, France, in the events of 'Arts et Santé'. More info click here. 18 & 19 May, 2019 Shomyo workshop at Ateliers d’ethnomusicologie, Geneva, Swiss. More info click here. 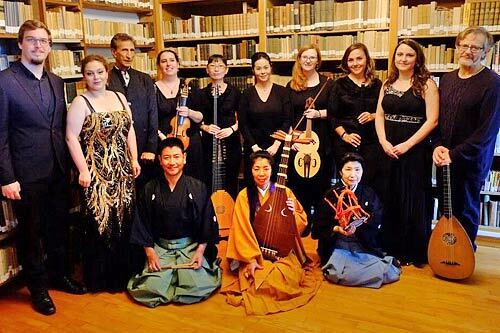 16 June, Sunday, 2019, 14:00 ~ 17:00, Shomyo workshop at Leo Kestenberg Musikschule im Haus am Kleistpark, Berlin. More info click here. 9~12 July, 2019, Shomyo workshop at ‘Les Suds à Arles’ le festival de Musiques du Monde, Arles, France. More info click here. The live recording of the concert at St. Caecilien/Museum Schnuetgen, in the festival Romanischer Sommer 2018 Köln (7 June 2018) will be broadcasted on 11th July 2018 in WDR 3 Radio program Konzert at 20:04 - 22:00. More information, click here. 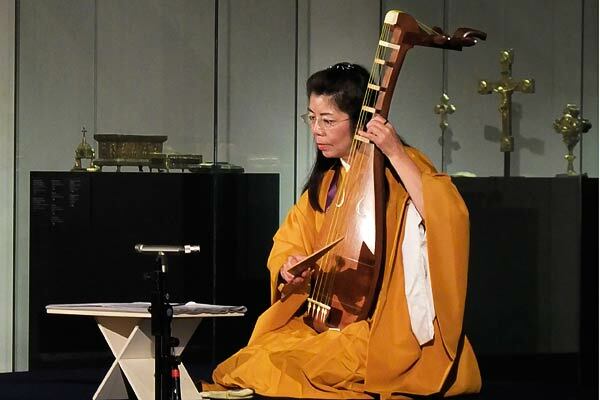 Shomyo Chant and Heike-Monogatari biwa story-telling at St. Caecilien/Museum Schnuetgen on 7 June 2018. 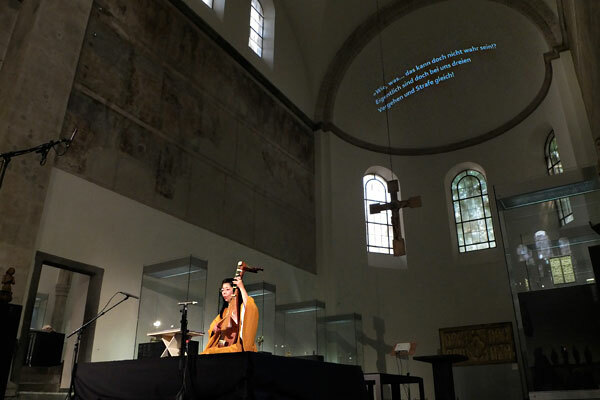 14 September, 2018: Duo Ueda Offermans concert. 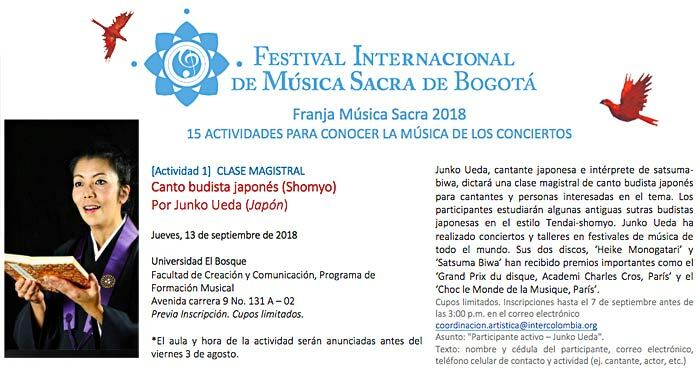 “Japanese Buddhism in music - ritual and stories” at the International Sacred Music Festival of Bogota, Colombia. The Duo performs: Tsuru-no-Sugomori (flute solo), Shomyo chant (voice solo), Heike-Monogatari (biwa/voice & flute), Inner-Voices (voice & Thumpy flute). 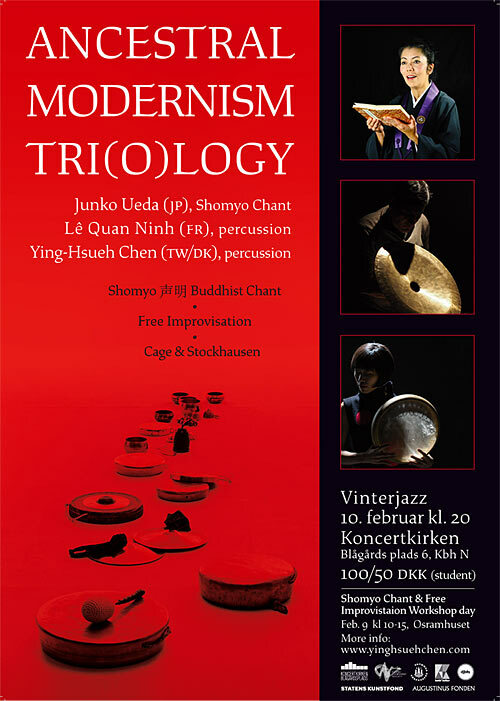 17 March, 2018, 20:00: Duo Ueda Offermans Concert titled ‘We-Air’ at Sundsvalls Kulturskola, Kupolsalen. 18 March, 2018, 8:30~10:00: Shoymo Workshop at Sundsvalls Kulturskola, Dance Room. Junko Ueda performs Shomyo chant in the Festival des Musiques Sacrées du Munde,’Sacrées Journées de Strasbourg’. 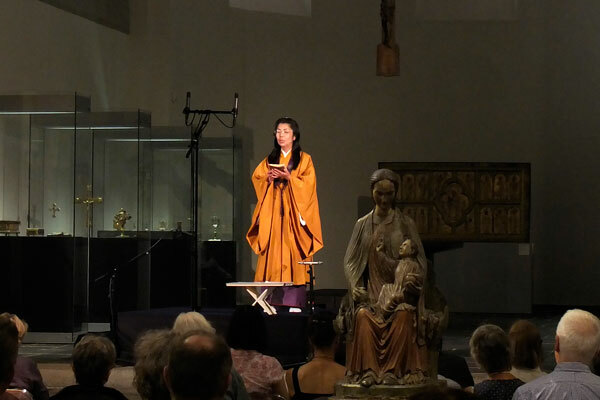 14~16 April, 2018, at Zen Temple of La Gendronnière, France, in the events of 'Arts et Santé'. Click here to read the review of the concert ‘OULOMENEN - Le Chant des Guerriers’ at St-Pierre-aux-Nonnains, Metz, France on 22 September, 2017. 19 - 21 September, 2017: Shomyo Buddhist Chant and Gion-Shôja singing workshop with students of Département de musique ancienne de la Haute école de musique de Genève. The workshop will be held in Sarrebourg in France. 22 September, 2017, 20:00: Biwa concert at St-Pierre-aux-Nonnains, Metz, France, in the program of ‘OULOMENEN - Le Chant des Guerriers’. More information, click here. 14 & 15 October, 2017: Shomyo Buddhist Chant workshop at Ateliers d'Ethnomugicologie, Geneva, Swiss. More information, click here. 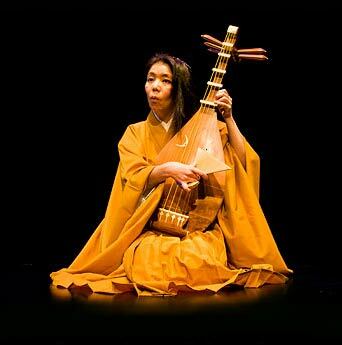 2 - 4 February, 2018: Shomyo Chant concert at the Festival Sacrées Journées de Strasbourg, France. 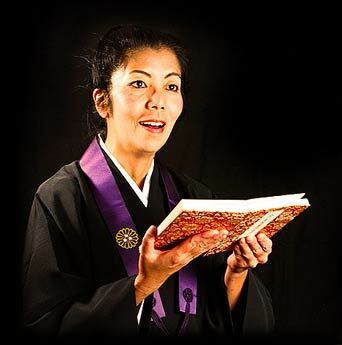 Recently Junko Ueda has started giving lessons for Shomyo chanting and Gion-Shôja singing by Skype. If you are interested, feel free to contact to know more details and pricing. And a regular private lesson at her studio or at a location is always available as usual.